These 101 photos were made on four trips to China's Far West, the provinces of Sichuan, Gansu, Qinghai and Xinjiang, in 2000, 2003, 2005 and 2006, mostly in August and September. They are arranged in a way to follow the last collecting expedition of Vladimir Nabokov's naturalist and explorer Konstantin Godunov-Cherdyntsev whom he created in his big last Russian novel Dar (The Gift), written in Berlin between 1934 and 1938, first published in English in 1963. In Chapter 2, the storyteller (a young Russian émigré writer in Berlin by the name of Fyodor Godunov-Cherdyntsev) tells about his father, and what he tells reflects Nabokov's admiration for his own father, the statesman, criminologist and publicist Vladimir Dmitrievich Nabokov who in 1922 had been assassinated in Berlin by Russian tsarists. But Fyodor's father is something altogether different: the leading Russian entomologist of his time, author of the first and only Russian butterfly atlas and forever in search of "new" butterflies. Mainly because of them he travels to remote regions of the Russian Empire and to Central Asia. His son surprises his readers with a very vivid and detailed account of his father's last trip to Central Asia from which he never returned. Fyodor clearly is imagining this trip. So was Nabokov. As a youth he had dreamed of going on a similar expedition to Central Asia, perhaps with the famous Russian explorer Grigorii Grum-Grzhimailov. But he had never been there. Now what Nabokov as a writer always cherished was detail. He did not care for generalities and abstract facts and figures. But even the slightest detail had to be right. For him it would not have done to assemble a few general facts about the regions he wanted his character to traverse and to fake whatever detail his report required. He needed true and telling details – and gleaned them from those who actually had been there, the European explorers between 1850 and 1915. When sick in bed in the winter of 1932-33, Nabokov studied the travelogs of Grigorii Grum-Grzhimailo, Nikolai Przhevalski, Pyotr Kozlov, Mikhail Pevtsov, Vsevolod Roborovski, A.E. Pratt, Hamilton Bower, Thomas Allen, Régis-Évariste Huc, Gabriel Bonvalot, Sven Hedin and probably many others. From them he borrowed a little over 100 telling details, and out of those he created Konstantin Godunov's imaginary expedition. Still it is more than a mere collage. It is an intensely colorful travelog in its own right. Nabokov was forced to proceed in this way (and he did so only once in all his life) to impregnate his imaginary voyage with what in his eyes it required, "the amazing music of truth". It is possible to extract enough information from Chapter 2 of The Gift to roughly understand where Konstantin Godunov went. But with the help of Nabokov's sources, it is possible to deduce his exact itinerary. He set out from Tashkent in the summer of 1916. In Przhevalsk on Lake Issyk (today Karakol in Kyrgyzstan), he bought horses, mules and camels for his caravan and in company of an assistant and probably several Kossack helpers entered into China at Gulja (Yining). 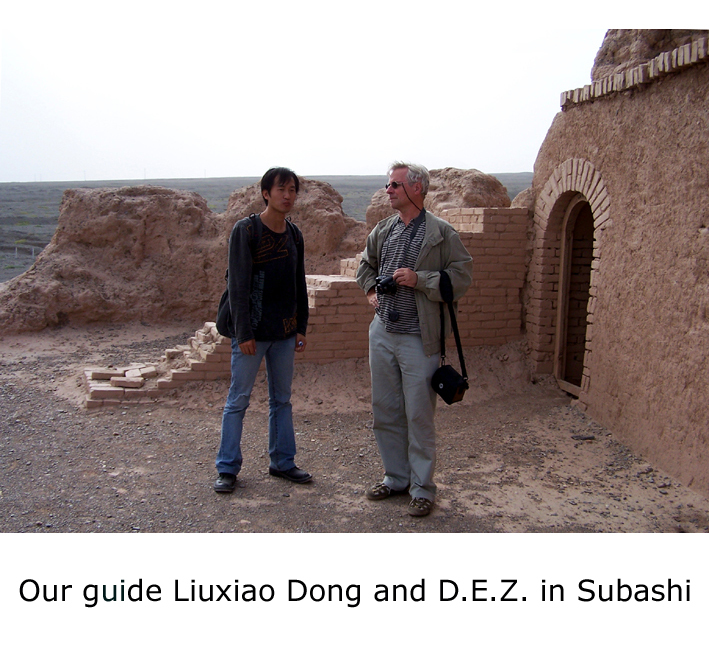 They went along the Borohoro range of the Tian Shan into the desert-and-steppe plains of southern Jungaria, occasionally advancing into the high mountains, crossed them eventually into the westernmost parts of the Gobi in the region of Hami, K'u-shui and Sazhou (today Dunhuang), continued through the Hexi Corridor to the sands of Alashan (today Badain Jaran Shamo) and into central Mongolia, turned back, spent the spring of 1916 in the "Nanshan" (the mountain ranges north and south of the salty "Blue Sea" of Kokonor), went up to the Tibetan plateau and then east into China, followed the Yangtze River down as far as Ichang, turned back and reached Kangding (formerly known as Tatsienlu), the Chinese border town facing the Tibetan province of Kham, went into Tibet at least as far as the sources of the Yellow River and resolved to return to Russia via the Lop Nor in the Tarim basin. Somewhere between Kangding and Lop Nor his son lost track of him. Konstantin Godunov was last seen by a French missionary in the vicinity of "Chetu" (i.e., Zheduo) near Kangding. All the correspondencies between Nabokov's text and its sources have been traced in an English language article  and a German language hardcover book . The photos show what Godunov and his author would have seen if they had traveled almost a century later. Conspicuously missing is Tibet and Lop Nor, less conspicuously Kyrgyzstan and Mongolia. IMPORTANT NOTICE: The photos of this album are public in so far as they may be freely downloaded and used for strictly private purposes. However, if these private purposes include some sort of distribution, in print or online, the names of the photographers must be given. Every sort of commercial distribution, in print or online, requires their written permission, to be obtained from Dieter E. Zimmer, Claudiusstrasse 6, D-10557 Berlin, Germany.